Introduction – Chqeta'maj le qach’ab’al K’iche’! After a brief introduction describing the unit objectives, each unit starts with a text in K’iche’ (TZIJONIK), which can be a story, a conversation or a song. Listen carefully and read it aloud several times until you feel comfortable with your pronunciation. Remember, your goal should not be to achieve perfect articulation but communicational success! Do not feel discouraged if you struggle with some of the harder K’iche’ sounds. 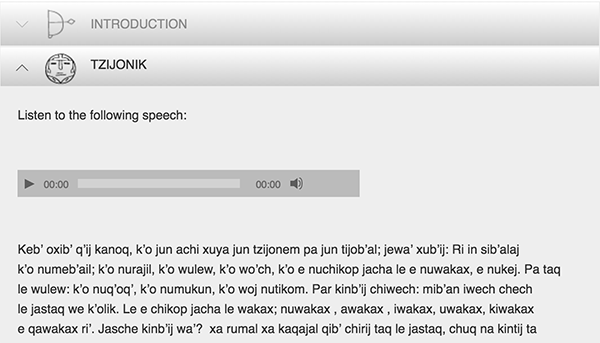 Click on the audio links in the new vocabulary section (K’AK’A TAQ TZIJ) at the end of each unit to hear each word pronounced individually. Following the TZIJONIK section, you will find a detailed discussion of the grammar needed to understand the text (KEMCHI’). 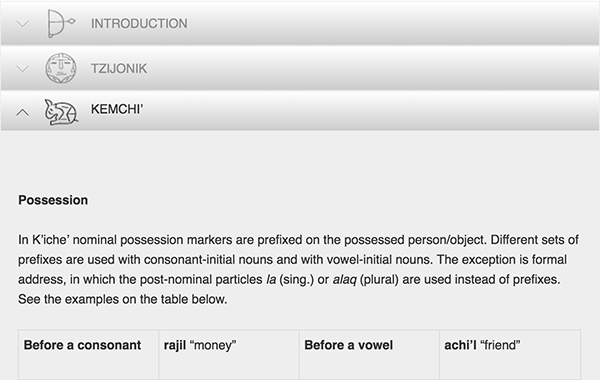 Each unit focuses on one particular aspect of K’iche’ grammar so sometimes it may not include everything you need to know to understand the TZIJONIK text. But do not worry! Any loose ends will be systematically introduced in successive units. Finally, the exercises (CHAK KECH TIJOXELAB’) will allow you to practice and assimilate your newly acquired skills. Attempt every task and write your answers on paper or on your favorite word processor. Check your answers by clicking on the ANSWERS link.